Southern Illinois University Edwardsville’s University Housing is contributing to utility savings and achieving greater safety and security through an LED lighting project. 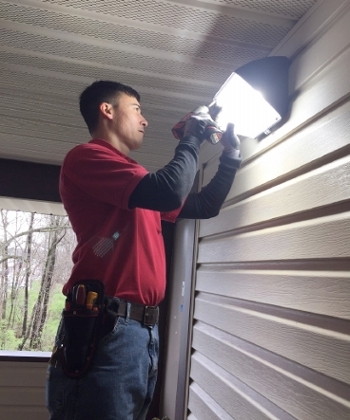 University Housing Facilities Management (UHFM) was awarded a $21,000 grant through the Department of Commerce that was used to update the exterior lighting at Cougar Village Apartments. LED lighting is one of the easiest ways to reduce your carbon footprint, and boasts both cost efficiency and effectiveness. The new, brighter lights offer students a greater sense of security when traveling to and from their apartment. University Housing and UHFM are continuously looking for ways to be more sustainable and seeking to secure grant opportunities that support these efforts. Collaboration between various staff in University Housing brought an impactful project to Cougar Village in a short time frame. For more information on sustainability initiatives or the LED lighting project in University Housing, please contact Tracey Kane at tkane@siue.edu or 618-650-3931. Photo: David Balai, UHFM electrician, installs new LED lighting in Cougar Village.